Anand R. Marri, vice president and head of outreach and education at the Federal Reserve Bank of New York, and professor of social studies and education (research) at Teachers College, Columbia University, has been named dean of the Warner School of Graduate Education and Human Development. Rob Clark, University provost and senior vice president for research, announced Marri’s appointment, which will begin on Jan. 1 with a five-year term. 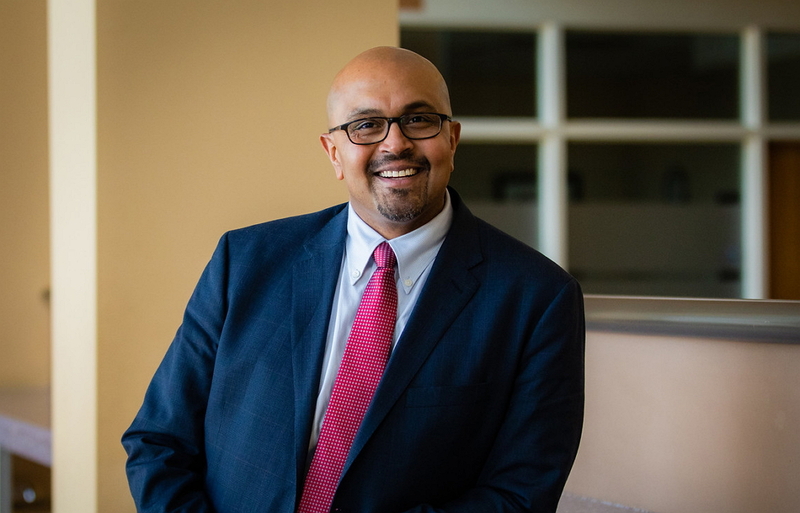 “With his energy, intellect and passion, Anand Marri immediately stood out as the top candidate to lead the Warner School of Education,” said Clark. “He is well respected among educators in New York State and nationwide, and he has clear ideas for how the Warner School can thrive in its missions to innovate K-12 education, contribute research that addresses the most profound problems facing U.S. education, and effectively prepare teachers and administrators to make a difference in the schools that need them the most. “I want to especially thank the search committee for their dedicated work over many months to identify our next Warner School leader,” said Clark. A search committee led by School of Nursing Dean Kathy Rideout and including faculty members and leaders in education and human development conducted a national search to identify the school’s new dean and successor to Raffaella Borasi, who has served as Warner School dean for 18 years. Borasi is continuing on at Warner as founding director of the new Learning in the Digital Age Center. “I’m delighted to welcome Anand to Rochester and I am confident he will be the next great leader of our school of education,” said University President Richard Feldman. “He’s especially passionate about strengthening the Warner School’s research mission and expanding the national visibility of the work being done within LeChase Hall and out in the community. “I also want to thank Raffaella for her dedicated service and continuing commitment to the Warner School. She skillfully grew and strengthened the school for almost two decades, including the formation of the East High EPO, which required strong, sustained leadership,” said Feldman. The Warner School dean is a senior academic leader at the University who shapes the vision and objectives for the school, generates resources in support of those priorities, and effectively manages its operations. The dean develops the school’s strategic plan that ensures its financial sustainability, builds community both within and beyond the school, fosters interdisciplinary collaborations, and maximizes its impact on the fields of education and human development. A former high school social studies teacher in California’s Santa Clara and San Jose school districts, Marri joined Teachers College, Columbia University in 2003 as assistant professor of social studies and education and became full professor (research) in 2017. At Teachers College, he founded the Economic Literacy Initiative as part of the college’s Institute on Education and the Economy, and worked closely with faculty on a variety of multidisciplinary projects. Since 2013, while holding a faculty position at Teachers College, he has also served as the highest-ranking officer for education in the Federal Reserve System. At the Federal Reserve Bank of New York, he has been responsible for the organization’s strategic vision for community and economic development initiatives, and educational programs that reach more than 40,000 people annually. He also oversaw the Federal Reserve Bank of New York’s Museum and Learning Center. As an Equal Employment Opportunity Officer for the New York Fed, he was responsible for administering the organization’s EEO policy and helping ensure a workplace free from discrimination and harassment. In addition to his extensive leadership experience, Marri currently serves on the board of visitors of the University of Wisconsin–Madison’s School of Education. He received a Ph.D. from the University of Wisconsin–Madison, a master’s degree from Stanford University, and a bachelor’s degree from Bowdoin College. « Who ping-punk’d Papa Haydn?